Cammeray is a suburb on the lower North Shore of Sydney, New South Wales, Australia. Cammeray is located 5 kilometres (3 mi) north of the Sydney central business district, in the local government area of North Sydney Council. Cammeray is mostly a residential area. 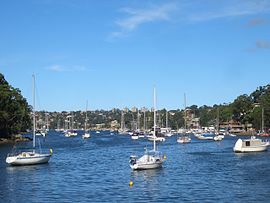 Some houses have waterfront access such as those in Cowdroy Avenue and the end of Cammeray Road, leading down to Folly Point. Cammeray is named after the Cammeraygal, the Aboriginal tribe who once resided in the North Sydney area. Cammeray was the site of Sydney's first quarry, with sandstone blocks from the quarry making many of the first buildings in Sydney town. Cammeray was for a time the home of Joseph Palmer Abbott, Australian politician and solicitor. Abbott built Tarella, a two-storey Italianate mansion in Amherst Street, c. 1886, on land he had acquired in 1881. Palmer Street in Cammeray was named after him. Tarella includes a coachhouse at the rear, with a distinctive clock tower. It is listed with the Heritage Council of New South Wales. Amherst Street was named after William Pitt Amherst, who was Governor-General of India 1823-28. Miller Street, the main thoroughfare of Cammeray, is lined with restaurants influenced by Chinese, Thai and Italian cuisine, as well as several cafes, the local post office, a petrol station and many other small businesses like dentists and jewellers. The Green Park shopping area makes a small hamlet, within the village of Cammeray. is a shopping centre that feature Harris Farm Markets and around 17 speciality stores. Cammeray is the last of the south-bound bus stops for services that operate via the Warringah Freeway to the Sydney central business district, although other south-bound services do travel to North Sydney, Milsons Point and Crows Nest. Long Gully Bridge, a sandstone bridge spanning Tunks Park that once carried trams to Northbridge in the early half of the 20th century, is located at the northern end of Cammeray. It is now a vital link to suburbs north of Cammeray, and is an easily recognised feature to people living in the surrounding area. Cammeray Public School, catering for students from Kindergarten to Year 6, is situated on the corner of Palmer and Bellevue Streets. Anzac Park Public School opened in 2016 and caters for students from Kindergarten to Year 6, is situated on the corner of Anzac Avenue and Ernest Street, on the site of the old ANZAC Club. Cammeray Children's Centre, a pre–school and childcare centre, is located at Warwick Avenue in Green Park. The Sydney Saturday School of Japanese (SSSJ; シドニー日本語土曜学校　Shidonī Nihongo Doyō Gakkō), a weekend Japanese educational programme, holds classes for Japanese national and Japanese Australian students at the Cammeray Public School. The All Saints' Anglican church, part of the Naremburn Cammeray Anglican Church, is located in 5 Carter St. Cammeray. The Sisters of St. Joseph are located in 1 Lytton St, Cammeray. Cammeray sits within the Catholic Parish of Our Lady of the Way. The Parish has three churches: St Mary's North Sydney, St Francis Xaiver at Lavender Bay and Our Lady of the Star, Kirribilli. St Mary's North Sydney was established in 1856 and was the first Church on the North Shore of Sydney. The Parish was established by the Society of Jesus, known as the Jesuits. While there are also some older high rise apartment blocks in certain areas of Cammeray that were built several decades ago, the majority of residences are in the form of stand-alone or semi-detached, single or double-storey houses. Many of the quieter streets are lined with trees and have nature stips. This gives Cammeray a pleasant green look. Recently there have been many housing redevelopments in the heart of Cammeray Shopping Village. They take the form of low rise apartment blocks. Tunks Park is a recreation area, popular among joggers and those wishing to walk their dogs. It also provides Cammeray with three sporting fields, notably cricket pitches during the summer, soccer, rugby league and union fields during the winter. The Norths Pirates Junior Rugby Union Club, is Cammeray's local village rugby union team who play all home games at the western field of Tunks Park. The North Sydney Brothers, a junior rugby league club also have all their home games there as well as the rugby league teams of Marist College North Shore. Cricket and golf are both well represented with the Cammeray Cricket Club and Cammeray Golf Club. Cammeray Golf Course is a nine-hole course that is situated between Cammeray Road and the Warringah Freeway. Situated near the golf course is a tennis club and soccer field where the local junior soccer team, the North Sydney Bears, practice. Cammeray also has a mixture of social focal points, including the ANZAC Club (closed on 31 December 2010) and the North Sydney Leagues Club. is on Cowdroy Avenue and fronts Long Bay. The Marina was established in 1890 and has been operated by the Rabbitts family for 2 generations. The Marina has long been popular with long stay international cruising yachts and has good protected deep water moorings. ^ a b Australian Bureau of Statistics (27 June 2017). "Cammeray (State Suburb)". 2016 Census QuickStats. Retrieved 17 July 2017. ^ Pollon, Frances, ed. (1990). The Book of Sydney Suburbs. Australia: Angus & Robertson. p. 45. ISBN 0-207-14495-8. ^ "Tarella". New South Wales State Heritage Register. Office of Environment and Heritage. H00270. Retrieved 18 May 2018. ^ "Substation - Bellevue, Cammeray". New South Wales State Heritage Register. Office of Environment and Heritage. H00937. Retrieved 18 May 2018. ^ "Long Gully Bridge". Transport: Roads & Maritime Services. Government of New South Wales. 31 October 2011. Retrieved 15 September 2012. ^ "Home page". Cammeray Public School. 2012. Archived from the original on 28 June 2012. Retrieved 15 September 2012. ^ "Cammeray Public School". Education & Communities: NSW Public Schools. Government of New South Wales. 8 November 2007. Retrieved 15 September 2012. ^ "Anzac Public School". 2017. Retrieved 6 March 2017. ^ "Cammeray Children's Centre". The Australian Child Care Index. December 2011. Retrieved 15 September 2012. ^ "Home page". Norths Pirates Junior Rugby Union Club. 2012. Archived from the original on 28 June 2012. Retrieved 15 September 2012.